This post will concern itself with how to summarize academic articles and what is the best way to prepare an academic essay (exam or term paper). 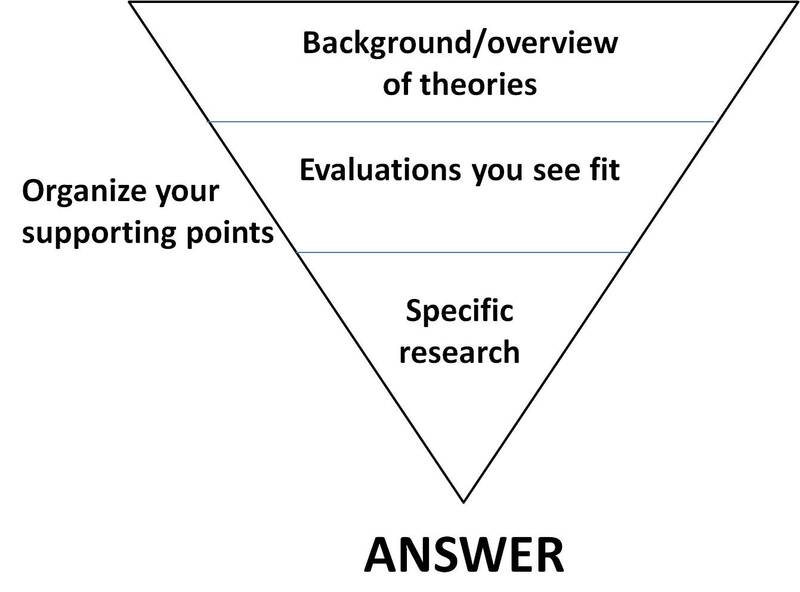 When it comes to formulating a research proposal, answering an essay question or approaching an exam question, descriptive answers are usually redundant. You are usually asked to critically analyse (although they may not use the term ‘critically analyse’, they may say ’discuss, compare and contrast’ – this is all the similar ways of asking you to critically analyse). If we wanted to know the descriptive details, we would open the book ourselves. You are really being asked to show adequate research of the field, an understanding of topic and appropriate material choice. You are basically demonstrating your ability to comment on a specific area of research, this is what you are usually graded on. A good metaphor or example of assignment structure is seen above with my example of a filter. Structuring your answer as a filter will allow your argument develop in a concise and comprehensive way. The example of a filter is suitable to essays, article summaries and exam essay questions. You generally introduce the topic to the reader, introduce your argument (1st paragraph) and then argue ruthlessly for your side of the argument! A good argument will also discuss contradicting arguments and evidence, but generally you will strengthen your own argument by doing so (as long as you don’t present a bunch of contradiction, which will seem like you don’t understand the material). Another good metaphor for putting your academic assignment is to imagine the topic as a circle. In order to starts and establish your argument, you must look at the evidence and pick a point on a circle (the part of research most appealing to you) and construct your argument. In an academic assignment, choosing the material is your personal opinion on the area of research, which is why using personal conjecture is generally frowned upon. Another useful (yet obvious) piece of advice is ALWAYS back up your work! Prepare for the unlikely or you may lose the will to live!! I’ve lost a few essays back in the day for not backing up correctly. I recommend using a memory stick and a storage site like dropbox. Alternatively you could email the file to yourself. Just make sure there is another copy of your work and save as you go! Obvious advice yet probably the most important and easiest to overlook! Remember nobody is trying to catch you out, we were all in the same position at some stage – we know what it is like and don’t give exams/assignments for the fun of it. ANALYZE: Break into separate parts and discuss, examine, or interpret each part. COMPARE: Examine two or more things. Identify similarities and differences. Comparisons generally ask for similarities more than differences. CONTRAST: Show differences. Set in opposition. DISCUSS: Consider and debate or argue the pros and cons of an issue. Write about any conflict. Compare and contrast. EVALUATE: Give your opinion or cite the opinion of an expert. Include evidence to support the evaluation. ILLUSTRATE: Give concrete examples. Explain clearly by using comparisons or examples. OUTLINE: Describe main ideas, characteristics, or events. SUMMARIZE: Give a brief, condensed account. Include conclusions. Avoid unnecessary details. This post presents material I would generally give in a typical of a class. I give tutorials in academic writing for undergrad psychology students just getting started but I altered the material to suit pretty much any field of research. I hope that some of the advice helps, however its certainly doesn’t suit everyone. In a class setting I usually get feedback from people who disagree with the approaches presented here or individuals who don’t find it helpful. This would usually result in me creating an individualised study plan for the student. If you would like more advice or help just leave me a comment and I’ll be sure to get back to you – even if I cannot directly help, I may know where to go for the best advice tailored to your needs!